The Apple iPad didn’t go fail, unexpectedly, and as the latest WWDC reported, there were more than 2 million iPads sold till date. Now that’s a number! 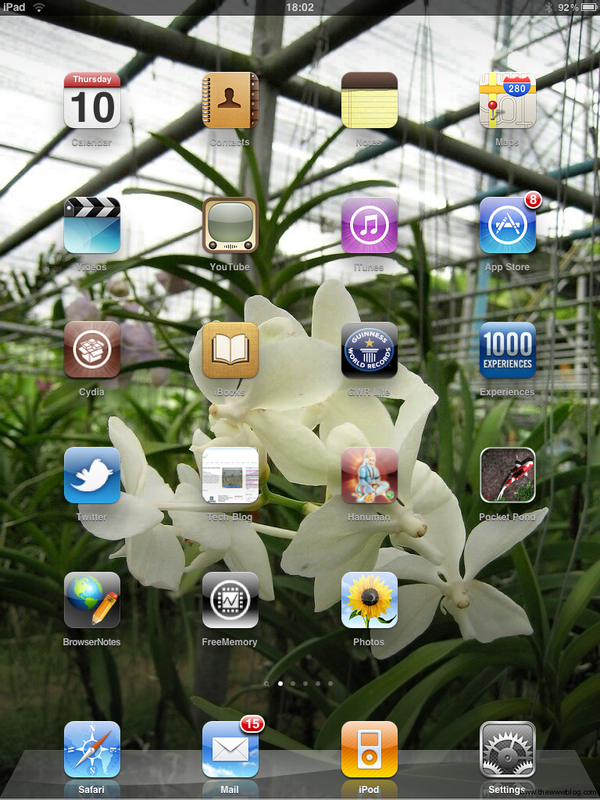 But many iPad users still need to learn a lot of basic things, to make their user experience better. Copying a word or couple while reading any web page, is easy by just clicking on the word a couple times. But if you want to copy a complete paragraph in the article, it isn’t hard. Just hit on the paragraph 4 times in a row. For some, it won’t come, as hitting it multiple times would just zoom in or out the page. There, just tap the screen twice, and swipe your finger over the paragraph. Will select the whole paragraph. 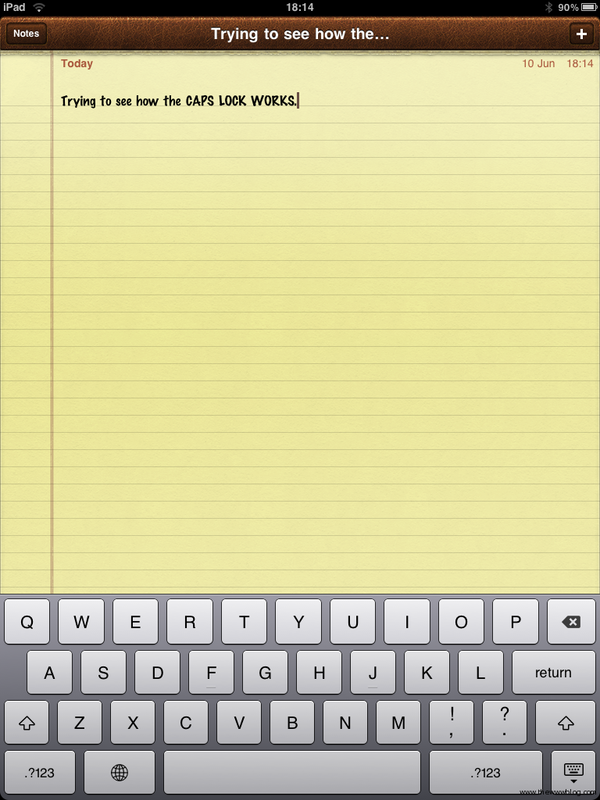 One of the best thing in iPads is the size which allows you to write notes with its nice and big virtual keyboard. So, when you are writing some notes, story, posts etc. the need for continuous capital letters is very common. Its almost frustrating when you have to keep the shift key pressed while typing capitals continuously, so there is this tip – Tap the shift key twice within a second, and you would see it activated for long. To search for something, better not to go search it in any particular app. Its common that we save things written in notes, and that includes your friends phone numbers etc. So searching Contacts for that won’t lead you to results in notes. 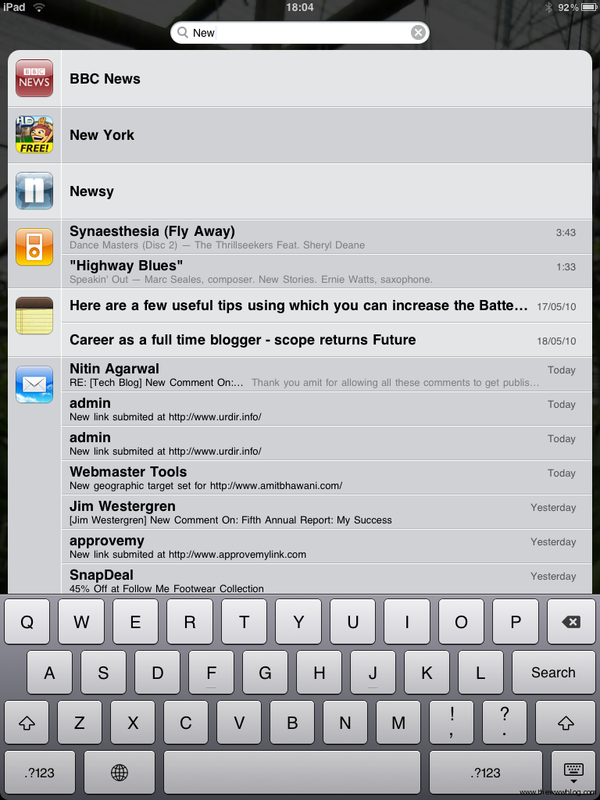 In such cases, use the spotlight search, which goes through every app and gives you the organized results. By default, there are only 4 apps in the dock in the lower pane, which can be modified, so that you can see the most favorite or important apps can be listed there in the dock. Its easy to add a couple more, to make the total of 6 apps in the dock. Just press any app for sometime until you see the apps shaking, and available to move. Shift the 2 apps into the dock when you can edit them. Filling a website extension in laptops is commonly done using Ctrl+Enter for .com which is still easier in the iPad, with the help of a key in the on-screen keyboard. But the facility doesn’t end there, you can enter various other extensions like .net, .org, .edu, .co.uk, .ie by just holding the .com key for a second a small section is raised from there allowing you to select one of those extensions. You bought and downloaded many applications for your iPad, and then some circumstances make you delete everything or reset the iPad settings, everything is lost. But that doesn’t mean you would have to spend again to get those apps. The information of the ones you buy is stored in the App store, so you can download them back later from the App store. This is a good option for those who are concerned about their iPad usage by other people around them. Some might download songs from the iTunes store, download apps and install them from App store, all through the credit card. To prevent this from happening, you can set restrictions on few selected apps. 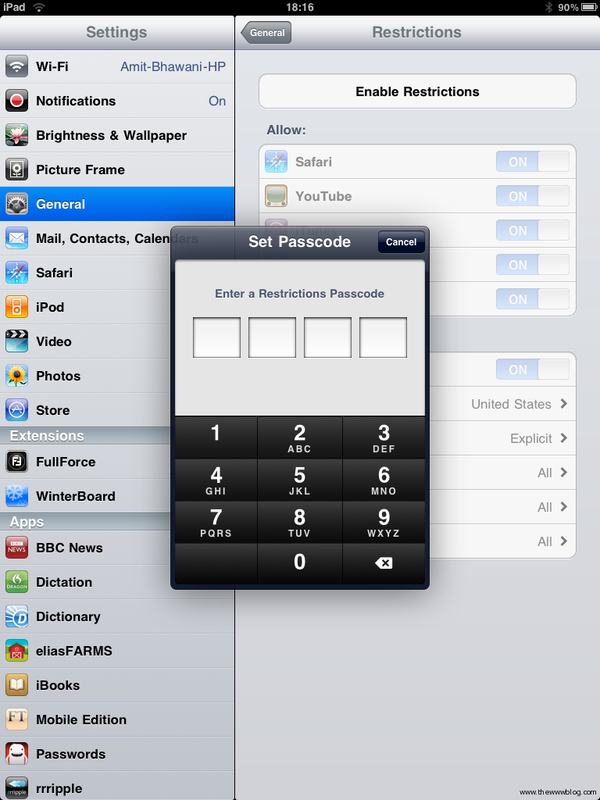 Go to Settings > General > Enable Restrictions > and set passcode which you can use while trying to use the app. Without hitting the passcode, one can’t download stuff or buy. 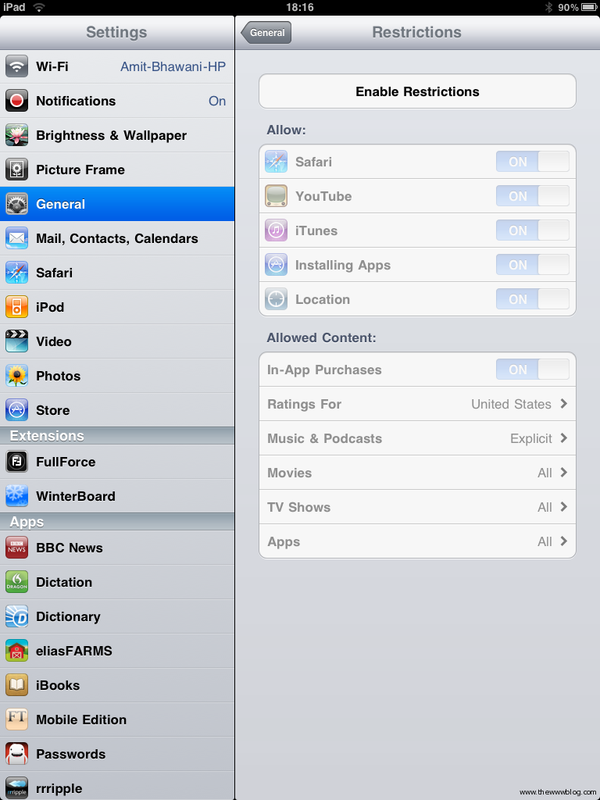 Safari, Youtube, iTunes, Installation of apps, Location are the ones which are restricted. Taking a screenshot in an iPad is nothing different from that in iPod touch or an iPhone. But the size of the screenshot is bigger than the others. Just hit Power+Home buttons together when you are at the page which you want to capture. Battery life is pretty good in iPad, i.e. around 10 hours normally. But if you want to increase it further, just play around with the brightness, keep Wi-Fi and location services off when not using it. Reduce the usage of heavy apps for gaming. You can’t avoid playing music or videos, but still can try to reduce the usage. Emailing is one of the best features we always see in Apple iPhone, iPad. 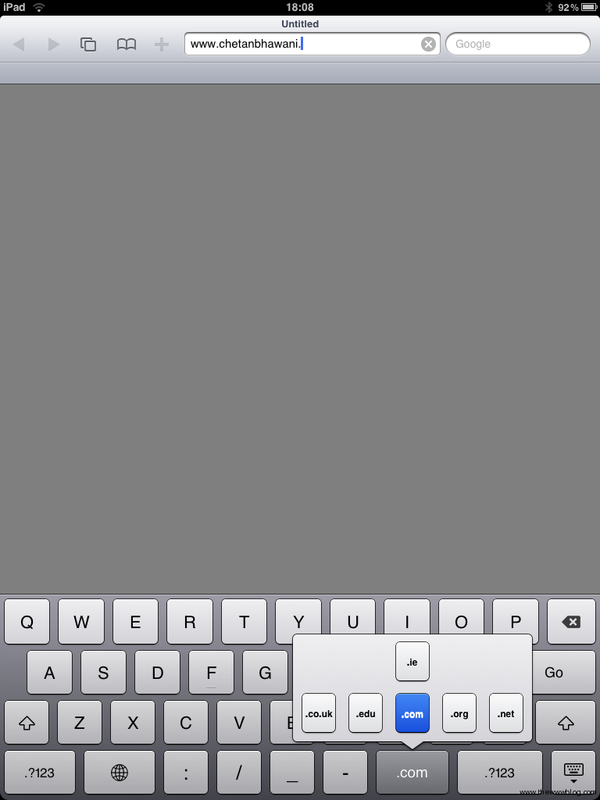 While you email through iPad or iPhone, you would try to save time and make the message smaller. 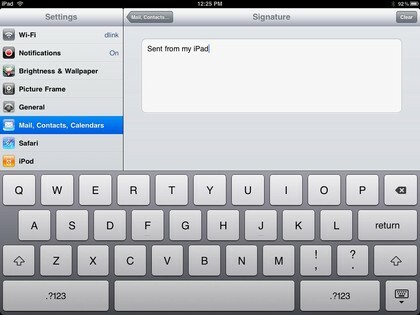 So, its better to have a signature that may notify the mail receiver that you sent the mail from the iPad. There’s an option for signature. Go to Settings > Mail, Contacts and Calendar and from there you can set anything. my boss got me an ipad and i thought i knew some shortcuts.. but these tips.. (especially spotlight over multiple apps) will definitely make things easier, as i am a student and have notes, lectures, emails all over the place. I’ve also always wondered how to take a screenshot!